ALL Strikes must be ABOVE the Waist of each fighter. Front leg sweeps, foot to foot, boot to boot, to the inside & outside of opponents front foot are permitted by BOTH feet of the striker/sweeper. No spin sweeps. If a fighter is "SQUARE" to their opponent (EX: Against the ropes, neither foot leading - equal weight on both feet) their opponent will be allowed to sweep inside or outside of "EITHER" foot. A spin kick or a hard thrown kick that does not hit the body but shows Intent of Power will be counted as a kick. Front kicks (snap, thrust or flick) must make hard contact to be counted as a kick. Each time a fighter does not make his/her minimum kick count in a round, they will be deducted 1 point for that round. Kicks may NOT be made up in other rounds. 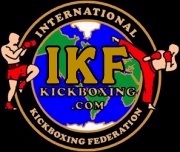 Long Full Contact pants are mandatory under IKF FULL CONTACT RULES. If a fighter does not have LONG PANTS they are required to either FIND SOME to wear or forfeit their bout. This will curtail the crowd from yelling for a fighter to "kick to the legs" which is often heard at ringside if the fighter is wearing kickboxing shorts. Secured to the foot with their elastis strap AND Athletic/Medical Tape. Cover all the toes and the entire heel. Laces should not be exposed. Chest Pads are only Mandatory " in ALL Junior MuayThai Rule Division Bouts.